Home to many iconic landmarks and a unique culture all its own, Chicago is one of the most special and significant cities in all of America. Situated on the banks of Lake Michigan, it's the third largest city in the country and has become known all around the world for its stunning skyline, rich history, industrial influence, and thriving nightlife scene with lots of live entertainment. Chicago is home to around 2.7 million people, with 10 million living in the surrounding metropolitan area, often known as 'Chicagoland', but the city attracts millions more each and every year, drawing in tourists from far and wide, all eager to see the sights and sounds of this famous place and experience the unique magic that only Chicago can provide. If you're planning a trip to Chicago and would like to enjoy a fun, special way to enjoy this amazing city, why not take a trolley tour? Chicago Trolley & Double Decker Co. runs trolley tours of Chicago each and every day, taking countless passengers on the ride of their lives around the city, stopping off at a long list of landmarks and attractions along the way. Chicago Trolley & Double Decker Co. got its start way back in 1994. At that time, it only had eight trolleys, but has grown and evolved over time to now feature a whopping tally of 39 trolleys, with 26 double-decker buses also forming the fleet. This company is the biggest tour operator in all of Chicago and the number one name to choose if you're looking for Chicago trolley tours. - Chicago Trolley Tours with Chicago Trolley & Double Decker Co. Riding the trolleys around Chicago with Chicago Trolley & Double Decker Co. couldn't be easier. This tour operator runs a variety of trolley routes and tours around the city, with its primary route featuring a classic 'hop on and hop off' system that lets you get on and off at the various stops as you please, all with the same ticket. Tickets can be purchased ahead of time online for discounted rates, and it's possible to buy multi-day passes too. If you happen to be visiting Chicago for a few days or weeks, the multi-day trolley tour passes are a good option, letting you ride the trolleys around Chicago as much as you like without needing to pay extra and replace your ticket each day. Chicago Trolley & Double Decker Co. also runs speciality trolley tours around Chicago on select schedules at certain times of the year, and tickets for these trolley tours can also feature multi-day passes and additional options like discounted rates for kids. Read on to learn about the different options you can choose from when finding your next trolley tour of Chicago. The classic Hop On Hop Off Tours from Chicago Trolley & Double Decker Co. start at 9 am and run through to the early evening, with the last tour leaving at 4 pm. These affordable, exciting trolley tours of America's third largest city offer something for everyone, and the route actually differs depending on the time of year. The summer months feature a Wrigleyville - Lincoln Park Zoo Route, while fall and winter offer a classic Downtown Tour. All of these tours offer hop on and off service, letting you descend at any of the many stops along the way and get back on later without needing to pay for another ticket. These trolley tours pass by many of Chicago's landmark locations and along the city's most famous streets, offering some super views and easy access to the most popular bars, restaurants, live entertainment venues, shopping areas, museums, and much more along the way. Be sure to bring a camera along to preserve some of the magical memories you're guaranteed to enjoy on this awesome Chicago trolley tour. The Chicago Land, Lake, and River Tour, as its name suggests, allows riders of Chicago trolley tours to enjoy an excursion on the city's waterways as well. Chicago is situated right on the banks of Lake Michigan and is also home to the famous Chicago River, so many visitors to the city want to experience the wonders of these waters for themselves. 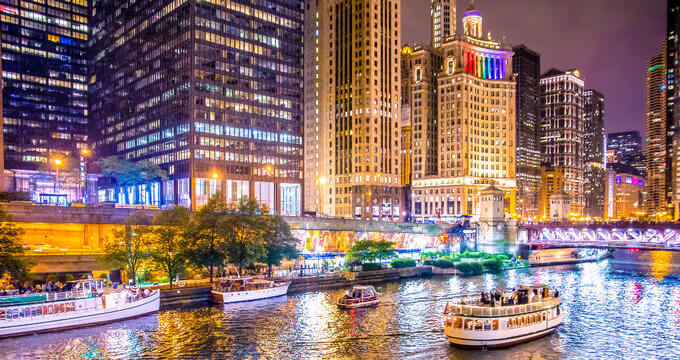 The Chicago Land, Lake, and River Tour lets you do just that, including a ride on the hop on/off trolleys around Chicago while also including a ride on either the Urban Adventure Cruise or Chicago by Night Cruise from Mercury. The Holiday Lights Tour is a trolley tour that runs through the holiday season in Chicago from the end of November through to the Christmas period. This tour takes you on a magical trip through the city's winter wonderland spaces, allowing passengers to admire the many lights and holiday decorations of Chicago. If you're lucky, you might even get to take the tour in the snow and really feel the spirit of Christmas down every street and around every corner. This tour even includes a toasty bag of Hot Cocoa Garrett Popcorn to keep you warm along the journey, as well as a pair of ZooLights 3D glasses to appreciate some of the displays put on by Lincoln Park Zoo.